Technical Data for Lantex® 100. Moisture Vapor Transmission Rate ASTM E96, Proc. B, mod. Need A Specific Chemical Tested? Know before you buy with Kappler's free testing program. If you need to document a Kappler fabric against a specific chemical hazard not already in our database, we make it easy with a custom testing program. We’ll conduct third-party testing on your chemical, and if the fabric meets your requirements you agree to purchase a standard minimum number of garments. For details contact Customer Service at 1-800-600-4019 or email us at customerservice@kappler.com. 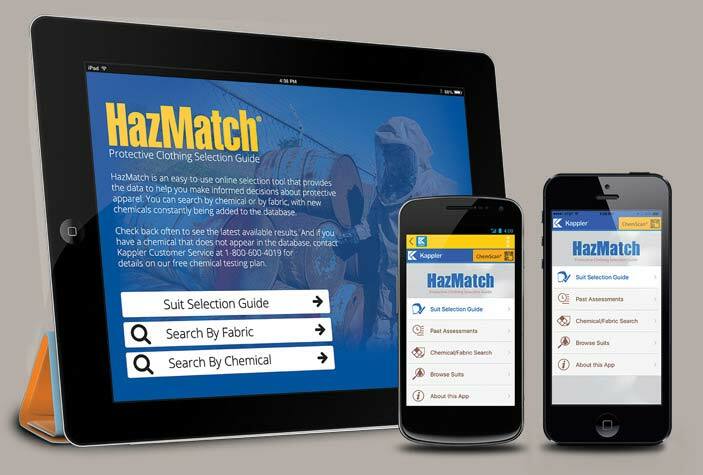 Hazmatch Protective Clothing Selection Guide. An selection tool that provides the data to help you make informed decisions about protective apparel.